This article is brought to you by PetFirst Healthcare. Vet bills can be thousands of dollars. You shouldn't ever be forced to decide between your dog or cat's health and paying rent on time. PetFirst allows you to get your dog or cat the care they need without worrying about the expensive cost of veterinary care. Check out their affordable and comprehensive plans here. If you frequent the dog run at Maria Hernandez Park, chances are you know Daniel Nogueira, the proprietor of the local dog care service Bushwick K9. 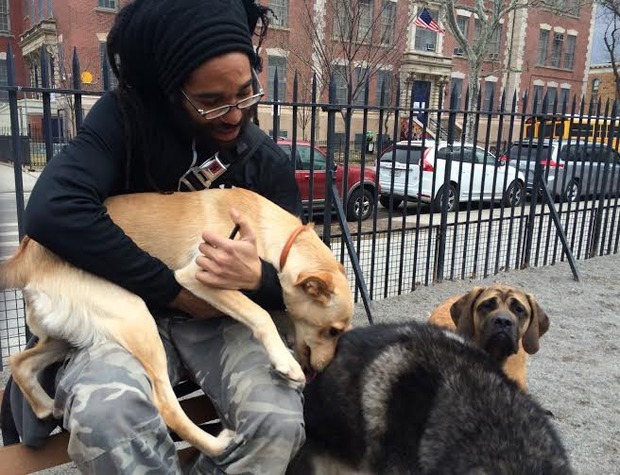 Nogueira, (pronounced noh-gay-ruh) is tall with long dreadlocks and a beard and has the grounded, content demeanor of a veteran preschool teacher, which makes it abundantly obvious how he became Bushwick’s most trusted, beloved dog care professional. A native of Brazil, Nogueira grew up playing with animals on his family farm. His family began breeding Dobermans when he was 10 and he became interested when an especially effective trainer started to work with their dogs. “This guy would come in, and all the dogs would just follow him everywhere and they would do everything he said at all times. That blew my mind, and I glued myself to the guy,” says Nogueira. With a clientele base of upwards of fifty families and two additional walkers in his employ (he’s about to hire a third), Nogueira has made himself a neighborhood institution. Nogueira has had a major success with a dog portraiture series he posts to Bushwick K9’s Instagram account. He says he started shooting photos of his charges at play because his clients would request photos “so they can know how they’re doing when they’re staying over and when they’re going for walks.” The Instagram account became a place to archive those photos, and photographers whose dogs Nogueira walks took notice and recommended that he get a professional camera to shoot with. “I want people to see what I can see in them,” he says. “Especially when it’s like, a crazy action shot, crazy face; it gives a different perspective on them.” We have to say, the Instagram account is an instant pick me up; we highly recommend you check it out. Bushwick K9, call at 646.610.1056 or email: bushwickk9@gmail.com.